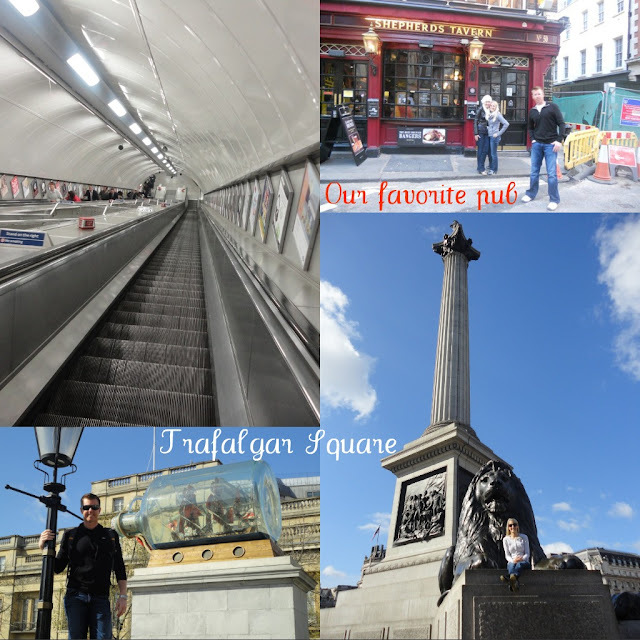 Then I Got To Thinking...: European Vacation, London! We were there just 2 weeks before the big Royal Wedding, and it was easy to see the city was in full swing preparing for the big day. It was all the buzz around town. We stayed at the Park Lane Hotel, and it was fabulous. 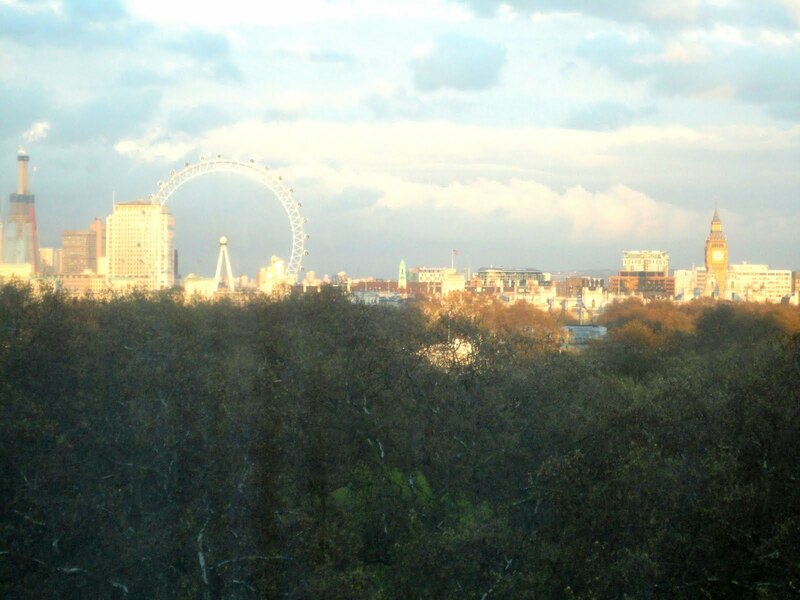 It was right across the park from the Palace and had beautiful views of the city. Filled with an old time charm, I felt like I was visiting london in the 50's. It was also close to The Tube, which we loved riding around on. We were only in London for 3 quick days, but it was amazing! I spent a big chunk of time doing a little Birthday shopping at Harrods, oh my, it was fabulous. I also visited the Burberry store and a few other big hits on our walk to Harrods. I only came away with a few little items, but it was fun to look around. While we were there, we also saw a Broadway Play... Les Miserables! 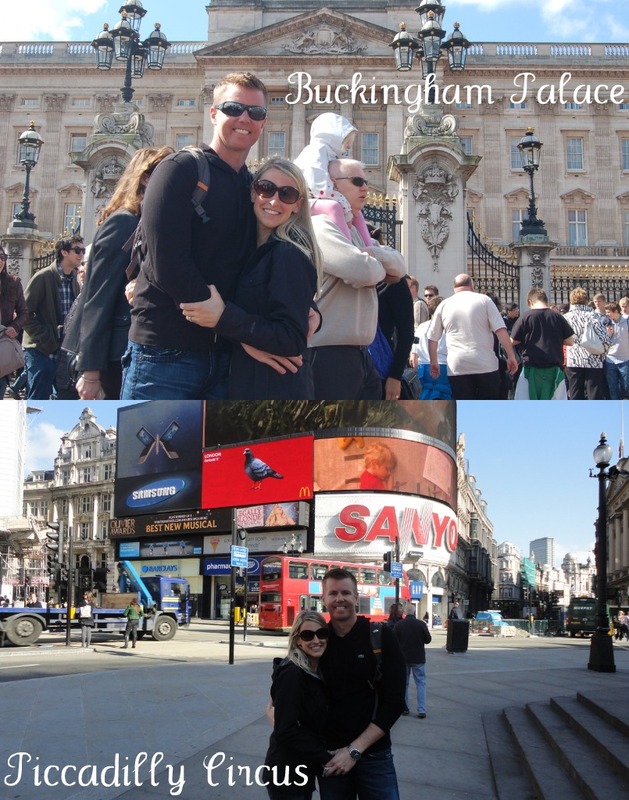 It was something we didn't do on our Honeymoon stop in London, and I was so glad we did it here. 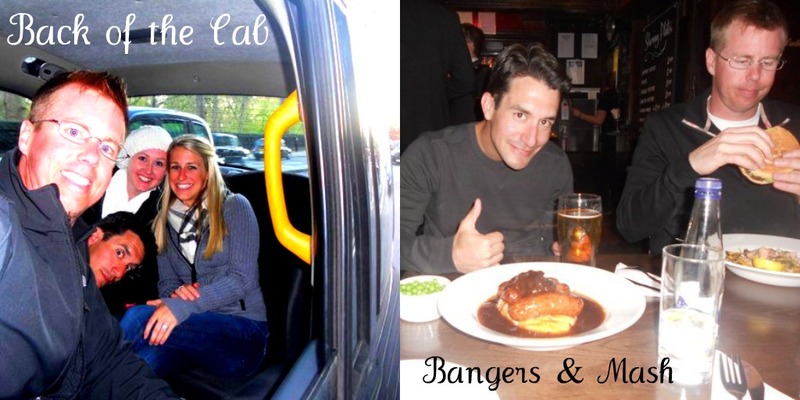 We had our friends, C & K with us in London, too - and it was a blast! Oh, dear London, I can't wait to visit you again someday! Ive always wanted to go to London!! It's at the top of my list. :) and what a fun time to visit!! Oh I want to go here too!~ thanks for sharing your pictures. How wonderful! I've always wanted to go to London. And that's so neat that you were there during the wedding prep! I adore London! My mum is British and so we used to go there every second year when I was still living at home! It's gorgeous in summer :) and it's currently Wimbledon which is an amazing experience! I love love love London. Totally want to live there some day. THAT is the view from your hotel room? Holy wow. 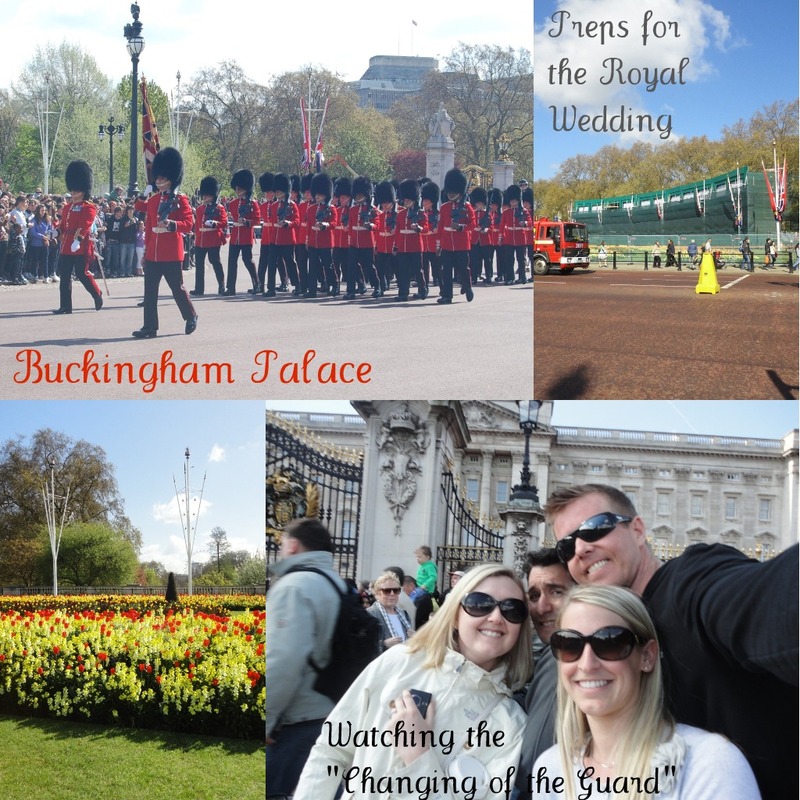 I just did the *sigh* like "I love that..." :) I thought about you during the royal wedding stuff and wondered if you'd gotten to join in any of the pre-wedding festivities or where you were in your trip at that point! :) I have always wanted to go to Europe... especially London. :) I love all these posts. So much! ahhh seeing these pics made me want to go back so bad... like so badly i started searching for flights... then i remembered i have a wedding to pay for.. shucks! :) looks like you had a wonderful time and hit all the great spots!! Wow, what a fab trip!! I haven't ever been to London...but it always sounds like such a great place to visit!! I loveeeeee London! I seriously look for jobs in London all the time - haha! And so cool you were there before the Royal Wedding, I just love it! And look at that beautiful blue sky. LONDON looks amazing! LOVE the pictures! I would have loved to be there for the Royal Wedding! I went to London in high school and loved it! I hope to go again someday! I love your photos! I can't wait to go to London! I have sisters in England and have always wanted to go visit. Never have though. I bet that was fun with the friends along. A trip to London is definitely on my travel bucket list! It looks like you guys had so much fun! Your pictures are so pretty! I'm so jealous of your travels :) I would love to go to Buckingham Palace! Oh my goodness I can only begin to imagine how wonderful London was! Great pictures!! Oh I love love love London!!! The photos look amazing. I was there for school and it was such an amazing time!